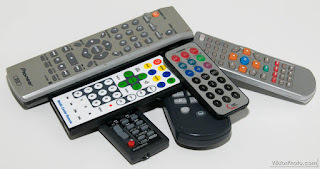 I have a few projects in mind for the near future which all have one thing in common – they all require remote controls to be operated. So I decided to experiment with remote controls a bit. A small selection of my huge pile of never or a very long time ago used remote controls that are waiting to be repurposed. 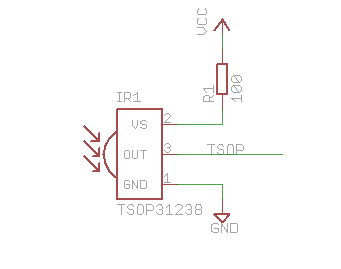 After a bit of research on the internet I found Vishay’s TSOP series IR receiver modules which greatly reduce the complexity in receiving IR messages. According to the data sheet: “The TSOP312.., TSOP314.. series are miniaturized receivers for infrared remote control systems. 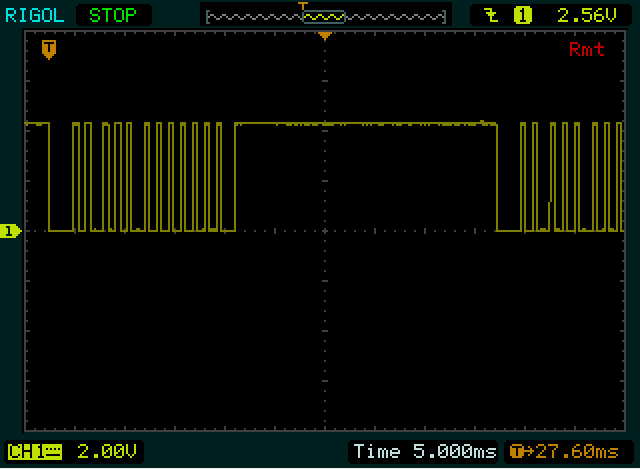 A PIN diode and a preamplifier are assembled on a lead frame, the epoxy package acts as an IR filter.” I ordered a few of these decoders and when they arrived I immediately created the minimum test circuit to check out how they work. 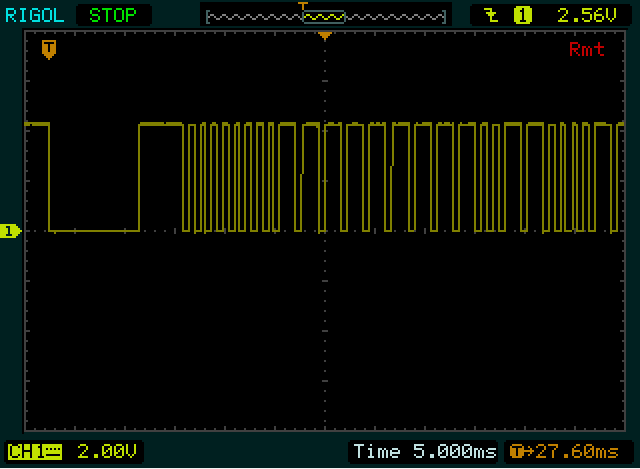 I used this minimalistic circuit to visualize the waveforms. I used an oscilloscope to visualize the decoded pulses, but I also found some other solutions for hobbyists without a scope on other web sites. 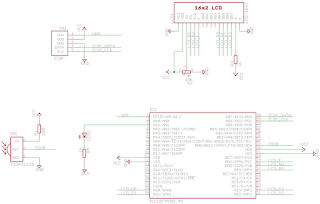 This page shows you how to use Microchip’s PicKit2 while this page uses a very simple circuit attached to the serial port of a PC to capture and visualize the output of the TSOP. Unfortunately, as you can see, no two remotes use the same standard. 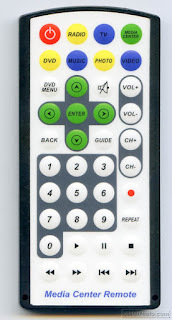 Eventually, I settled on using an IR remote of a Media Center that I had extra. This seems to use one of the simpler protocols of all the tested ones. This remote seems to use some standard very close to the NEC Infrared Transmission Protocol. The only difference I found is that the address bits are not repeated in inverse. It seems to me that this approach allows more devices to be addressed - at the cost of some loss off fault tolerance. The above samples are enough to understand how the messages are structured: the first two octets are the address, the third octet is the command and the fourth octet is always the inverse of the command. In the last column I included the name of the button I pressed, it is not part of the message. For my purposes it doesn't matter which way the octets are read, i.e. 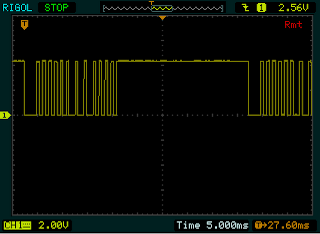 we can call the first octet 0x10 or 0x08, depending on if the LSB or the MSB is to the left. To move on to something more useful I created another minimalistic circuit on the breadboard. To decode the commands I used a PIC micro, an 18F4550. 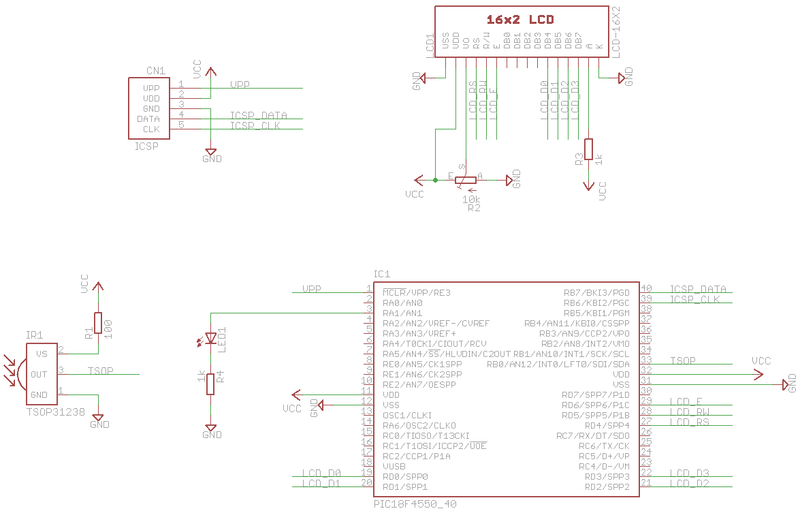 Of course, this is overkill if you only want to decode the commands, but I had my reasons: First, I wanted to move up a step from the base line micros and thought this would be a good opportunity to do so, second, I will need this chip later on in the real project(s) for the IR receiver. One LED to indicate the circuit is powered up (probably the most important :-) ). 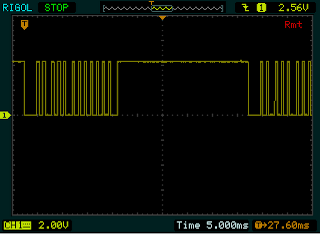 One LED flashing at around 0.5Hz in the main cycle, to simulate normal program execution. One LED that lights up during the decoding of a single command. 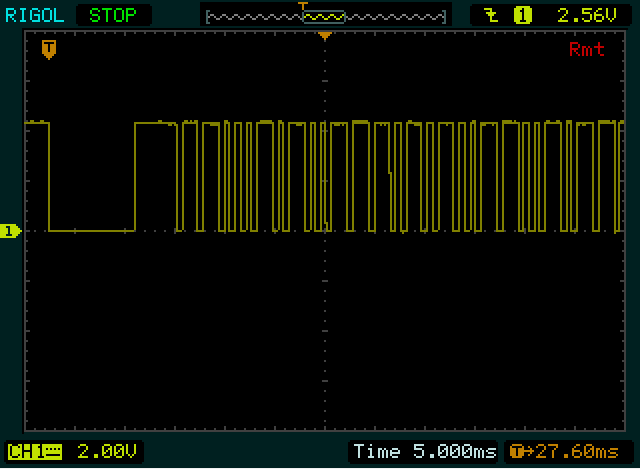 The firmware is very simple, given this is my first firmware written in C. In the main cycle it flashes an LED at around 0.5 Hz. 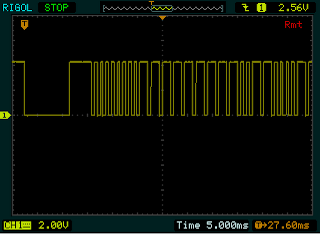 The demodulated signal is fed into the INT0 pin of the microcontroller. Every time (after a long idle period) a falling edge is detected the decoding routine is started. I think I arrived to a stage where I can move my focus on the actual project and can use this setup and routine to deal with the IR code decoding.